Snackmasters is a brand of jerky that operates out of Ceres, CA in the heart of the San Joaquin Valley. It got it's start in 1982, not making beef jerky, but turkey jerky. The company claims to be the first ever commercial producer of turkey jerky. Since then they've added beef jerky to their line up, and have slowly built a cult following in central and northern California. The company claims to use no preservatives and no artificial ingredients in any of their products. This particular line of jerky dubbed "Range Grown" represents turkey and beef raised without growth hormones, antibiotics or animal proteins, and fed a diet free of pesticides and herbicides. They also offer a line of regular jerky, in which the animals were presumably fed these deadly chemicals . I haven't been able to find Snackmasters here in southern California, though the company's website does show retailers down in this area. It's just not available in the major grocery outlets. It was a client of mine who discovered my interest in jerky, and presented me with a couple packages of Snackmasters as a gift. Range grown solid turkey breast meat, worcestershire sauce, soy sauce, liquid smoke, honey, vinegar, black pepper, spices. The tastes I pick up from the surface of these pieces is a light soy sauce flavor, a slight sweet flavor, and faint smoky flavor. In the chewing, I pick up a heavier smoky flavor, some of the worcestershire sauce, some salty flavor, and some black pepper flavor. The first thoughts that come to mind is the worcestershire sauce seems to play heavy role in the overall taste of this jerky. In fact, I'll go ahead and peg that as the dominant flavor of this variety. 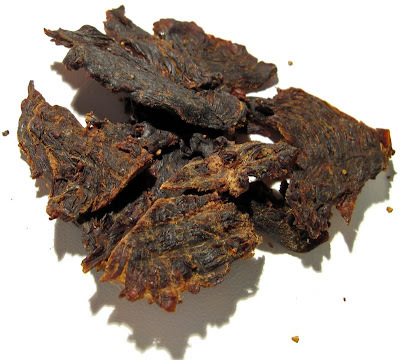 This jerky has a moderate flavor intensity; it provides a decent amount of flavor throughout the chew, though the surface flavors are on the light side. I don't really pick up any of the natural turkey flavors. I mean going through the first piece, I actually forgot I was eating turkey. I tried to focus in on the meat flavors in the subsequent pieces, but I just couldn't find anything that tasted like turkey. The level of salt intensity seems moderate. I'd say the second-most dominant flavor of this jerky is the black pepper. I don't really taste much of it on an individual piece basis. But after having eaten several pieces, it's flavor comes on in moderate strength. If you just evaluate this jerky's taste on a single piece, I'd probably give the smoky flavor as the second-most dominant taste. And so I'll just go on and say the smoky flavor is the third-most dominant flavor of this jerky. The soy sauce only seems apparent as a slight surface flavor. It's probably there in the chew, except the worcestershire sauce seems to overpower it. Overall, it's a good tasting jerky, mostly represented by the worcestershire sauce, but seemingly without any natural meat flavors. These appear to be slices of whole meat, sliced in medium thickness, and in small to medium sized pieces. 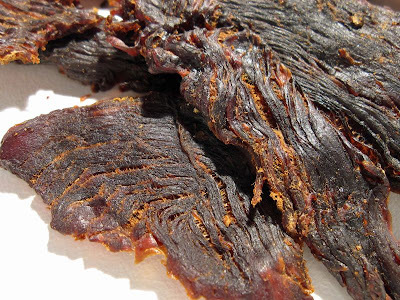 This is a dry jerky, cracking and breaking apart with just a moderate amount of bending. For the most part, tearing apart a piece is fairly easy, and it seems to chew fairly easy as well. The chewing texture is quite meat-like, though I can't really say that it's turkey-like. But it does have a fibrous, meaty feel to it as I chew through it. It's not really chewy at all. It seems to be fairly clean eating, I didn't pick up residue on my fingers, though I noticed a few pieces of black pepper falling off. The meat seems pretty lean, I didn't find any pieces of fat, tendon, or gristle. Snackmasters sells this range grown turkey jerky from their website at a price of $7.99 for a four ounce package. That works out to a price of $2.00 per ounce, putting this on the border between average and expensive. For general jerky snacking purposes, at this price, it's a good value. I do find a moderate amount of snackability in this with its moderate flavor intensity, it's worcestershire and black pepper flavor, and good chewing texture. A price of $2.00 per ounce might seem high for turkey jerky, but free range meat, including organic meats, are always priced higher. As a turkey jerky however, it's a poor value. I just don't find any turkey meat flavors in this. 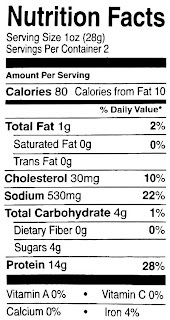 If you consider the nutrition facts label below doesn't show any health advantages with turkey versus beef, then you're not really getting anything unique with having turkey jerky. If you're going to buy this jerky, buy it purely for general jerky snacking. I do find this range grown turkey jerky with a good overall flavor, a good chewing texture, a moderate flavor intensity, and a moderate snackability. But I just don't get the feeling that those positives combine together to make this jerky above average. It's definitely a different taste than what I'd find in the mass-market brands, but then again, I keep feeling unimpressed. If it could start with a strong natural turkey meat flavor, and then color it with the worcestershire and black pepper, then I'd feel more inclined to give it a higher rating. But without any natural meat flavors, all it has working for it is the worcestershire and black pepper. And while those two components always make for tasty jerky, if that's all a jerky has going for itself, it's really just average. Interestingly, I had previously reviewed Snackmasters' range grown beef jerky, which I gave a "good" rating to. I said that it did well with its seasonings and marinade, despite having no natural meat flavors. For some reason, I just can't find the same situation with this turkey jerky. They both actually have the same ingredients. Maybe the beef jerky had a more intense flavor, or maybe it's just this particular batch of turkey, or maybe it's something about turkey meat that doesn't lend itself well to this recipe. I don't know, I'm just not as impressed with this turkey jerky than I was with the beef jerky. For my beer recommendation, I stick with a simple brown ale.